A&A OPTICAL – DALLAS, TX – A&A Optical announces the release of three new styles from Jalapeños® eyewear: Cant Hold Us, Legend and Who Says. Jalapeños® eyewear capturing the attitude of the young adult market utilizing the latest trends in graphic treatments, shapes, colors and materials, enabling the wearer to re-define their look and express their own personal style. Jalapeños® brand identifies with today’s fashion minded teens in addition to appealing to fashionable adults with small faces. Neon Crush. Cant Hold Us oozes funk, color and attitude with inside-outside coloring and modified oval eye shape. 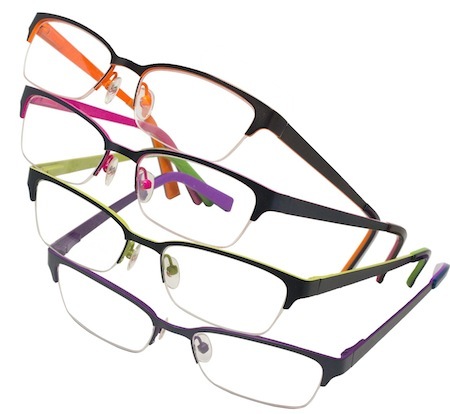 The metal frame is available in black/lime, black/purple, brown/orange, and navy/pink. Material Block. Legend features a metal fusion of sleek, matte and etched brick. The modified rectangle frame is available in black, brown and gunmetal. Who Says puts translucent temples on the line in colorful fashion. Available in black, brown and purple, the semi-rimless style features a modified oval eye shape.